Will your billing code survive launch day? "How do I make charges?" "What is PCI-DSS and why do I care?" "Should I be using webhooks?" "What happens if the Stripe API has an outage?" When I started working with payment integrations a few years ago I noticed a trend: they broke a lot. There's a ton of edge cases and error conditions to think about. Every integration I came across had big problems, ranging from how they dealt with API errors to not sending email receipts all the time to being horribly insecure. Every single one was incredibly difficult to debug because the original developer only thought about the happy path. They ignored the possibility that things not in their control may break. Tracing through millions of lines of logs, reading inscrutible error codes, and slogging through slapped together spaghetti code was my life. Every payment bug meant lost revenue when people couldn't pay. Every one meant lost time because I wasn't working on features that customers actually wanted. You don't have to deal with this. You don't have to put your teammates (or future you) through the pain of debugging a shoddy payments integration. 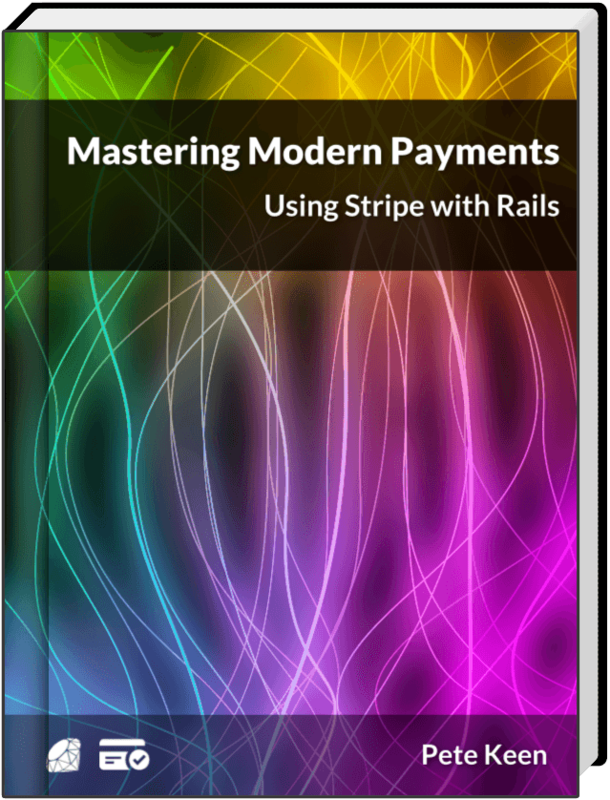 Mastering Modern Payments: Using Stripe with Rails distills the experience of building and debugging dozens of payment integrations into one concise, comprehensive guide. By the end you'll have a bullet proof system you can be proud of. Basic Integration Guides you through the most basic Stripe billing system possible and prepares your app for the rest of the book. Security and PCI Compliance guides you through the murky waters of the Payment Card Industry Data Security Standards and how they apply to Stripe. It also talks about security scanners and code analysis tools you can use to validate your code isn't susceptible to things like cross-site-scripting attacks and SQL injections. Custom Payment Forms shows you how to get away from Stripe Checkout and build your own payment forms, your way, with your own framework. State and History teaches you why and how you should build your application with explicit state machines. It also walks through why keeping audit logs of the changes to your models is so very important, and how you can get them with just one line of code. Handling Webhooks describes how to handle Stripe's webhook events to alert you of errors, perform vital upkeep within your application, and send receipts to customers. Background Workers describes how to communicate with Stripe asynchronously. The Internet is a wild, wacky place, and your application needs to be able to recover from any number of errors, both internal and external. Subscriptions walks through your options for building recurring billing into your application, along with advice about emailing your customers and integrating analytics services. Connect and Marketplaces adds onto the basic integration again, this time allowing your app to sell things on your users' behalf with Stripe Connect and send them payments with Transfers. Mastering Modern Payments was like a pool of cool refreshing water after I'd been traveling in the desert of obscurity for weeks. Unlike the API docs, or most blog posts I found on the topic, Pete thought this through three steps ahead of solving the problems I'd be having a few weeks or months after deployment. This will end up saving me an immeasurable amount of time and money. I'm fairly new to Rails and setting up billing had me flustered for weeks. I was stuck, spinning my wheels, not knowing what was the best route to take. Pete's book is a guiding light of common sense and practical application. Now I can setup billing with confidence, and more importantly, ship my product. Mastering Modern Payments is a fantastic resource for integrating Stripe billing with your Rails app. Pete does a great job of pulling together existing resources and blending them with his own experience to provide a clear, valuable guide for billing with Stripe. I completely re-wrote my checkout using MMP's ideas. It's all looking much neater and more bullet proof now. The book gave me a lot of confidence my app wasn’t cowboy coded. Though I was somewhat familiar with Stripe, and wrote a not-insubstantial online store that has processed hundreds of thousands of dollars in charges in the last couple of years, I was never happy with the code I wrote. It felt fragile, and I had no real clue how to do things I wanted to, like moving it into a worker. I bought the book yesterday, and chewed through it pretty quickly, and it gave me the confidence to do some serious refactoring of my code. Today, I’ve made sweeping changes based on your work, including moving things to a state machine and using a worker to take care of the stripe calls. This is a significant win for me, and I did it in a fraction of the time that it would’ve taken me otherwise. So: thanks. Your book paid for itself about five times over already. MMP has helped 2065 people just like you confidently earn millions of dollars by getting their Stripe integration set up in hours, not days. MMP comes in two different packages. The Basic Package is your complete guide to building your Stripe integration correctly the first time. The Complete Package comes with a bonus: a complete example Rails application. This is the application that sold tens of thousands of dollars worth of the first edition of Mastering Modern Payments and illustrates all of the concepts in the book. No problem. Just send the amount that corresponds to the version you want to paypal@corastreetpress.com. The book covers the latest production versions of Rails, Ruby, and Stripe. The current version of the guide is the product of over three years of editing and conversations with hundreds of developers just like you. If you're a Rails developer integrating Stripe, this is the guide for you. That said, if you feel like you haven't gotten your money's worth, simply send me an email within 30 days for a full 100% money back guarantee. I'm Pete Keen. I've been a professional software developer for a decade, building payment systems and other software for companies large and small. I write a blog at petekeen.net with articles on topics ranging from Ruby and Rails to Perl and robotics and scattered book reviews. Put your email address in to receive a five part email course all about Stripe and Rails, including the first three chapters of MMP. Mastering Modern Payments is helping me out so much right now. I'm already farther along than with any other resource.